The legacy and testimony of Anna V. Johnson continues to echo in the lives of CPU students and alumni. In 1904, Missionary Anna V. Johnson began teaching Bible to women in her own living room. On October 20, 1905, Missionary Johnson started the Baptist Missionary Training School (BMTS) for women. The school was housed in the spacious residence of Missionary Briggs. From 1908 to 1914, 229 women were trained as “Bible Women” in that school. On June 7, 1930, Miss Anna Johnson, who served for 25 years as a missionary particularly in teaching “Bible Women,” died at Iloilo Mission Hospital and was subsequently buried at the American Cemetery in Jaro. Because of this, the BMTS was transferred to Burgos St., La Paz. Later, in 1936, the BMTS was moved again to the Baptist Student Center Dormitory in La Paz. 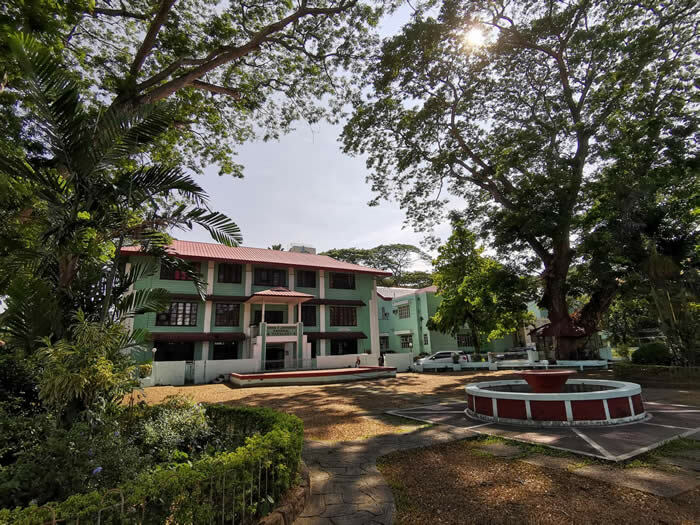 After a few years, in October of 1938, the BMTS was merged with Central Philippine College (CPC) as the Women’s Division of the College of Theology. Gregoria Jaime was the first “Bible Woman” who taught at the BMTS. Jaime was also the first woman to be baptized by immersion in the Jaro River in February 1901 after she was examined on December 9, 1900, one among the first 30 candidates for baptism in Iloilo. In 1915, it was reported that Gregoria was still active in the ministry. Another teacher of BMTS was Simprosa Sobremisana. Her death in 1910 was described as “a serious loss” for she was “a valued helper in the school and one of the earliest converts in the mission.” Simprosa was remembered as a courageous “Bible Woman” who preached in front of a band of outlaws who were accused of burning a village and killing several people. These outlaws repented and corrected their wicked ways. The “Bible Women” became involved in the mission work in many ways. They were both teachers and evangelists. Their work included Christian education, house to house visitation, and personal evangelism. They opened Sunday Schools in rural areas and diligently taught children about Jesus. They also preached in public places amidst prejudice. They even risked their lives evangelizing in areas where the American missionaries could not go because of the war. Some of them established local churches. They also taught women simple home industry and how to read the Bible in their own language. Munger bore witness to their earnest, faithful, conscientious work. They often put to shame male preachers by their activities and zeal and the results of their mission. Such was the case of Listina Alabi. In 1917, Alabi organized a church in Libakaw, Capiz. At first she started a kindergarten school which won her friends. By the time Missionary Anna V. Johnson visited her, two baptisms had taken place and a young woman from Libakaw decided to study at the Baptist Missionary Training School. Women in the ministry should be considered as pastors not only because they were trained, earlier than men in a missionary training school starting in 1904, but also due to their contributions towards the growth of local Baptist churches. After 80 years of Baptist mission in the Philippines, the “Bible Women” were finally ordained in the Baptist ministry. Bible Woman Angelina Buensuceso was given her proper recognition and proclaimed by the Bakyas Evangelical Church and Cosmopolitan Evangelical Church, Bacolod City as Reverend on March 22, 1980. Today, we do not call women in the pastoral ministry as “Bible Women” but as pastors. We thank the Lord for women trailblazers such as Missionary Anna V. Johnson.